The Guardia Civil are appealing to the public to help them identify this man. His actions were caught on the Bank’s security cameras as he unsheathed the knife, threatened the staff and calmly walked off with €5300. Police believe the man is in his 50’s with a pale complexion and possibly 6 foot tall. Although he spoke Spanish well it is suspected he is foreign. If you can identify this man call the Guardia Civil on 062. Calls will be treated anonymously. 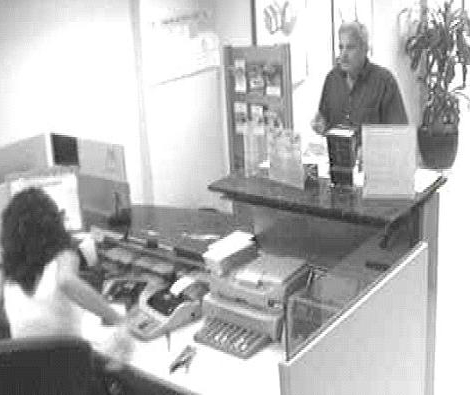 For the second time in three weeks Caja Canaria bank, Los Abrigos branch, was held up at gunpoint. The thief stole €4,400 in first robbery on 22nd February then yesterday at around 2pm the 2nd theif ran off with €2500 in cash which he demanded from the cashier while threatening her, and others in the bank, with a gun. A 27 year old Italian who tried to rob a bank at knifepoint in Playa Paraíso was arrested by an off-duty policeman. The attempted raid took place at just before noon in the Banca March branch. The raider threatened the cashier with the knife but was restrained by an off duty policeman, who happened to be in the bank at the time. In an attempt to avoid arrest the robber stabbed himself with his own knife causing a superficial wound. He was treated on the scene by emergency services before being marched off by the police. It is not known yet whether the Italian is behind the recent spate of bank hold-ups at knifepoint in the south of the island.